Roy Halladay's slider was renamed as a curve. Almost everyone considers this pitch a curveball. A.J. Burnett's sinker was changed to a plain fastball. He often works "fastball up, curveball down" so I don't think those are sinkers. I have no issues with Kalk's classification methods, not by any means, but I felt I should make those changes. 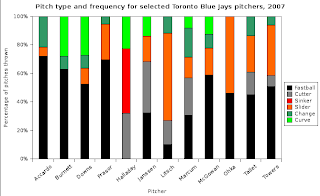 Marcum and McGowan are the best-covered pitchers, though we have the equivalent of two more analysed starts for Halladay. The five starters are represented well, and only one third of Janssen's pitches are missing. So if you want, you can pretty much ignore anything I say for Frasor through Accardo. Other general warnings about the accuracy of the Pitch-f/x system as a whole apply. In the Show, everyone can hit heat: Frasor, Towers, and Ohka (three pitchers who didn't exactly punch out the other side last year) barely threw a curve or change. Good stuff Craig. The " Young Hero" really does throw an assortment of pitches. I go back and forth as to how good he is, I'm somewhat optimistic. Glad to see another PITCHf/x blogger. Looking forward to your updates. Check out Cubs f/x - I'll add a link to your site, too. Richard, that wasn't me, that was Rob. The Young Hero's "slider"? That's actually his two-seam fastball. I'll let that sink in for a sec. Nice, eh? That's some serious break. I'm not sure what Litsch throws, actually. That's why I put this graph out there first. Should I just rename his slider or combine the two-seam with his other fastballs? Wait, how can that be Litsch's two-seam if it's recorded as low as 66 mph? What Josh Kalk has as Litsch's slider is definitely not a two-seam fastball. However, it's not all sliders, either. It looks like there's both a curveball and slider in that grouping, and probably some of what really are cutters got lumped into the sliders on his graph, too. It pays to be careful with Josh Kalk's pitch classifications if you're trying to serious analysis. For a little fun they're good enough. In my experience the version of his algorithm that's on the pitcher cards gets about 70% of pitches classified correctly, so take that for what it's worth. The algorithm is particularly bad about sliders and cutters and differentiating different types of fastballs. It usually handles changeups pretty well but doesn't do so well with splitters. Yah, there's no way you can really generalize about Jesse because his breaking balls were all over the place over the season. I figured he was throwing a cutter that's almost a slider, a true slider and a curveball. Then at the end of the year he morphed his slider and curveball into one pitch that was somewhere between the two.